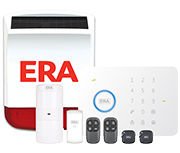 Era wireless home alarm system with smartphone monitoring. 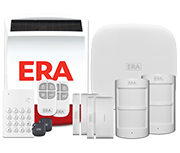 Fully expandable burglar alarm kit. SMS text alert when alarm is triggered. Compact control panel with backlit touch keypad. Also available with solar powered siren box. Components are pre-linked for a fast install. 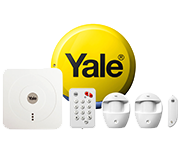 Connect up to 50 different sensors and 10 remote controls.